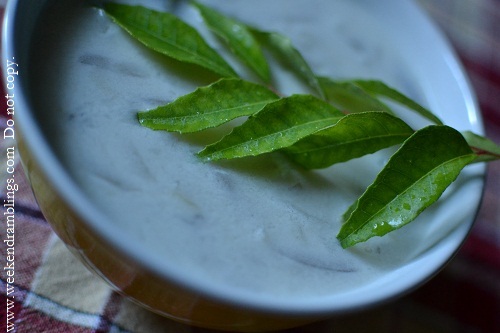 Ishtu is a very common dish prepared all over Kerala, and while there might be subtle differences in the flavorings, it is at its most basic a dish where vegetables (in the vegetarian version) like potato, onions, carrots, etc., are cooked in coconut milk with perhaps a few spices added in. I am guessing the name is some kind of a corruption to the word "stew." In my house, we make it in a very simple way with very few ingredients and hardly any spices and the only vegetables added are potatoes and onions. It is one of my favorite foods, and it definitely helps that it is an easy almost fool-proof recipe. The original recipe uses fresh coconut milk, prepared by grinding fresh grated coconut with warm water and squeezing out the liquid. 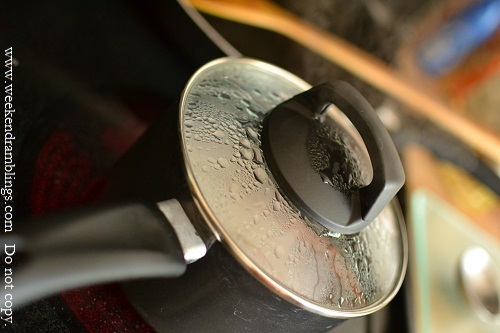 However, I have used tetrapak'd coconut milk that I have seen quite often in a lot of shops. Of course, the original version with fresh coconut milk has the best flavour, and this really cannot be compared to that, but sometimes the tetrapak is my best option and I really don't have a choice. I feel has a more artificial taste - and I have seen it in Bangalore (Spar). 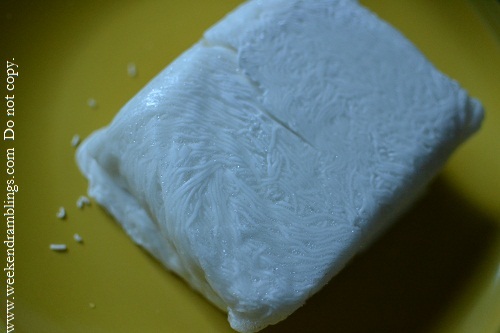 Coconut milk - about 3/4 of the pack (size 200 mL). 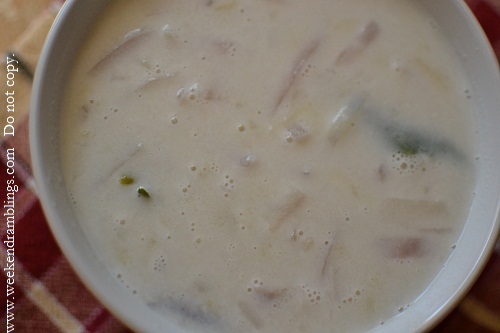 If you increase the quantity of chili and ginger you can increase the amount of coconut milk, but this is a very thick creamy milk and you won't need to add much to get a creamy consistency. 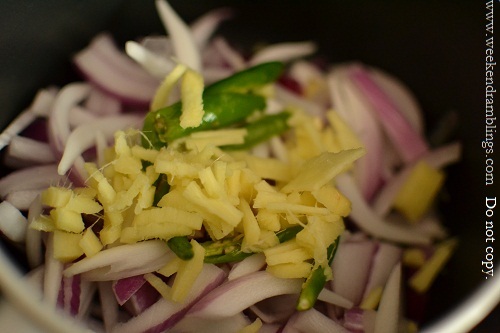 Take a thick-bottomed vessel and add the sliced onions, potato, ginger, chili. Add 3 tablespoons of coconut milk to it. Add about 1-1/2 cups of water and mix. Cover and let the vegetables cook on medium heat. 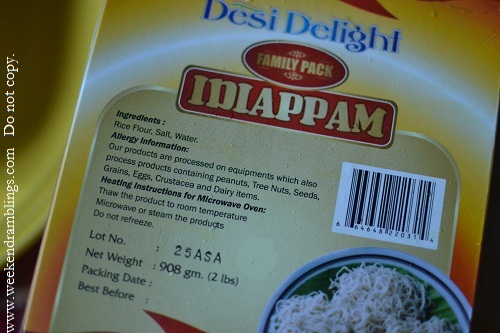 I served it with idiyappam - a kind of steamed rice noodle. I cannot make it from scratch now, so I just got the frozen ready-made version. Add the salt at the very end of the cooking. 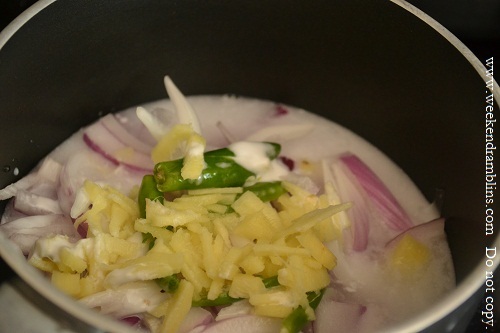 If you add it earlier, it will cause the coconut milk to separate and it won't form a smooth creamy sauce. I have tried making this with tinned coconut milk, and it's just not good, and I didn't like it with Dabur coconut milk either. Probably because Kara is labeled as coconut cream there is some difference, but this is the best option I have found so far. this looks awesome... :) i've always liked the taste of this but never made it....just a small doubt.... no need to saute the vegetables before cooking them in coccunt milk?